We got hit by the most snow of the season on Saturday. There was already 2" left over from the snow Wednesday and we got about 6" more inches on top of that! When I took these pictures Saturday morning there was only about 4 inches on the ground. We went to level the second floor and start on the stairs to the second floor. The house has started to settle as the logs dry out. 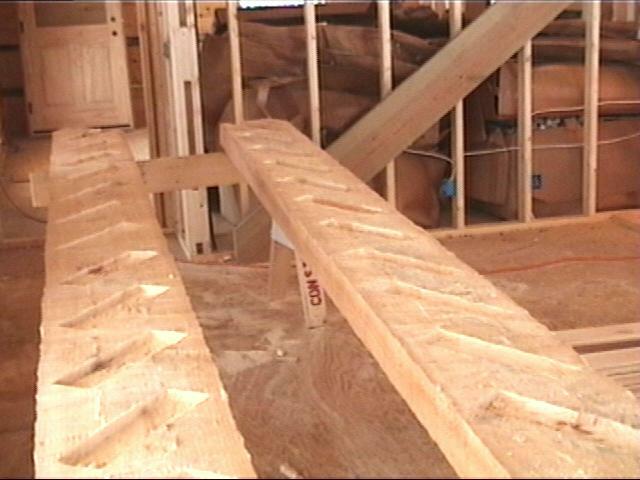 We had to let down the center support beams 5/8" to get the second floor back level. This means that the outer log walls have shrunk almost 3/4 of an inch since July. 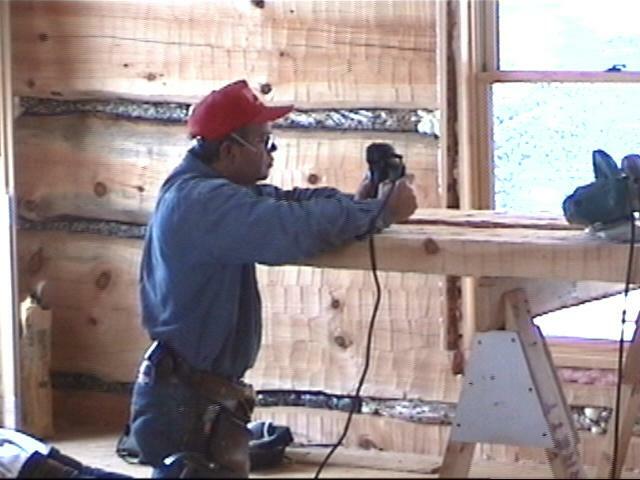 We had to level the floor before we started on the stairway so that it would fit correctly. 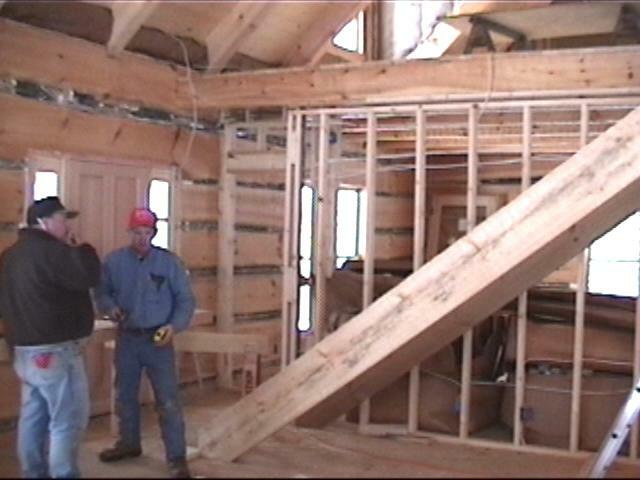 Here Dad and his employer Randy are making plans on how to build the stairs. High technology comes to the Ranch! 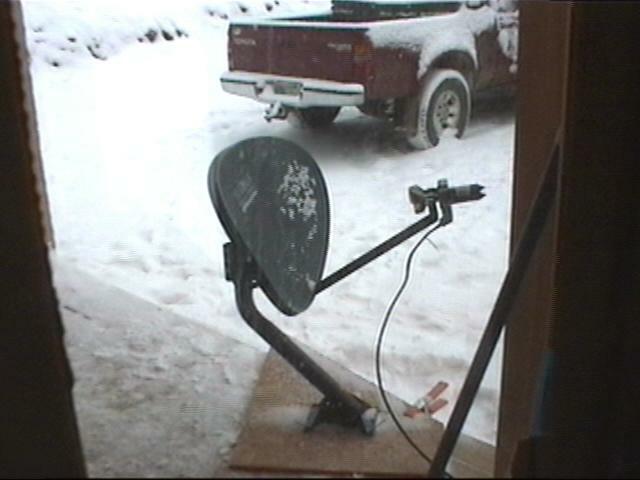 Since we are in a Winter Storm watch, I took my Satellite Dish and TV to the house. 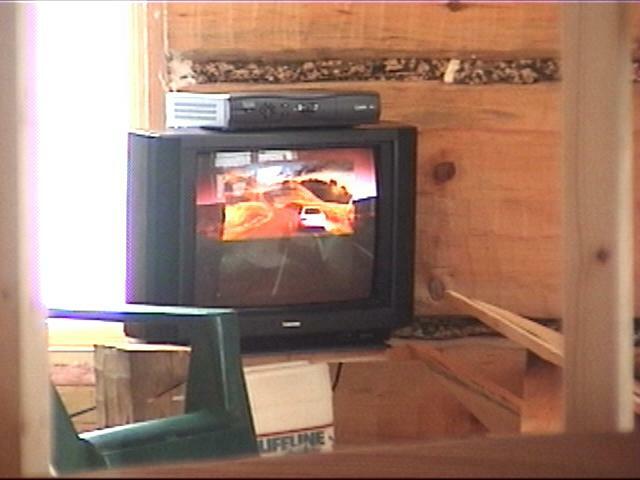 This was the first time there has ever been Television on the Ranch. Although there were several old house/cabins on the Ranch from about 1870-1950, they never had electricity, telephone, or indoor plumbing. Grady, who is in his 70's and now helps take care of the Ranch, left the last house when he was 24 in the early 1950's. I'll try to get some photos of Grady and tell some of his stories of him growing up in this remote place. They only went to town once a year! 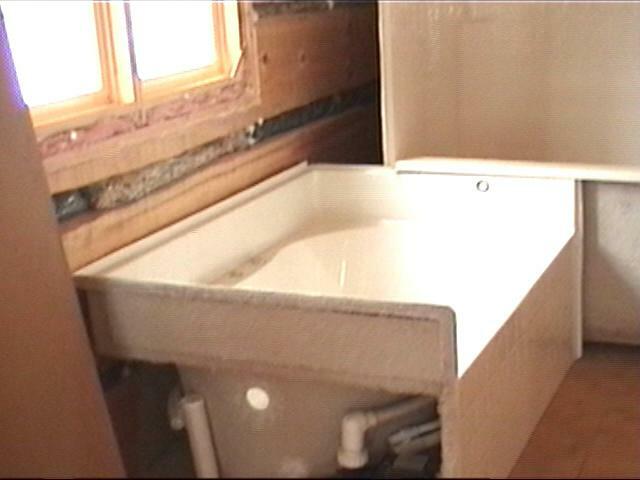 Here's the downstairs whirlpool tub and attached shower. We had to remove a wall last week to get the shower and tub in. We also got the shower tub up the ladder to the second floor bathroom with the help of Randy and Robert who fortunately showed up at just the right time. Here Dad's using his new RotoSaw to cut out the perimeter of where the stair treads will fit into the runner. Here's the stair runners after Randy and I carve out the space with wood chisels. Imagine the carved out spaces facing each other, the treads will be held between the runners by the slots to make a mortise and tenon joint. Timber and I go up on the hill to call out on my cell phone. This is looking back towards the house. Timber launching a direct pounce attack on me. He flies through the air and lands on me. Sorry but none of the pictures of the landing on me make sense, just fur and snow. 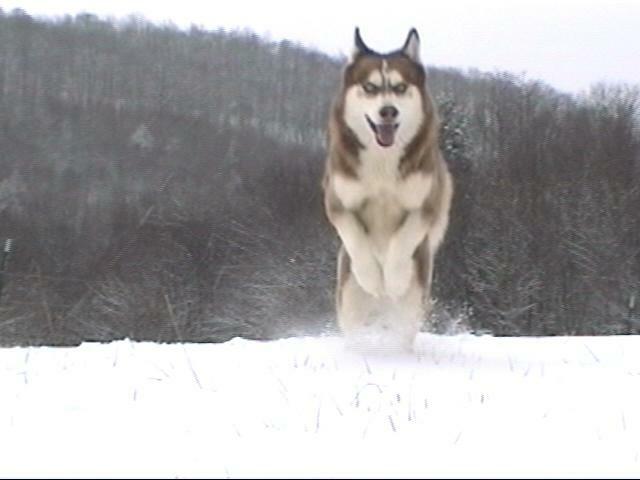 Timber loves the snow and get's super hyper playful. 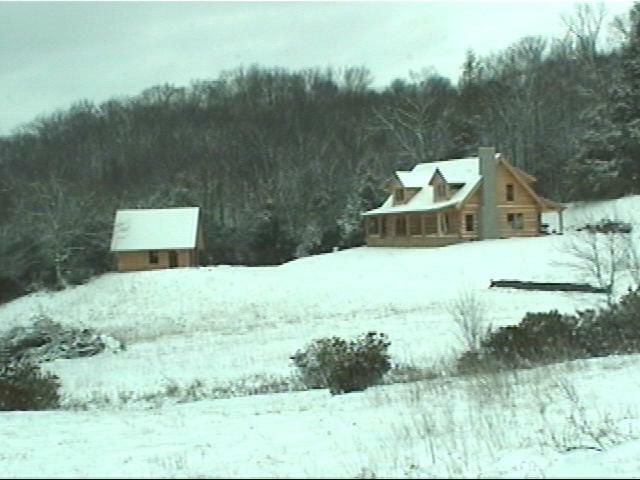 This is the view of the house as we come down the hill from making phone calls (green tint caused by Tundra windshield). All in all a productive day, even though it did take me an 1 1/2 hours to get up to the house and 1 1/2 hours to get down because of all the slick roads.